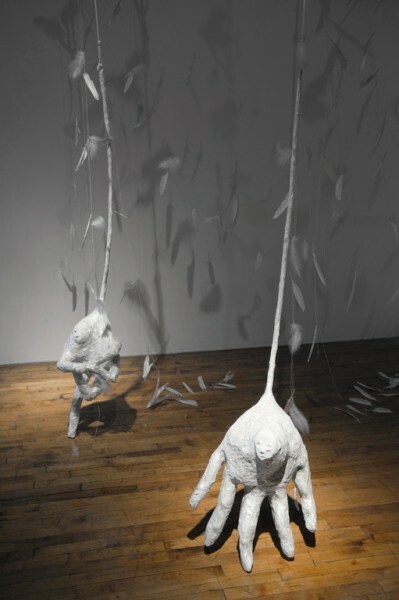 Artist Mindy Rose Schwartz has shown her sculpture and installations throughout the United States with exhibitions in Houston, TX; Brooklyn, NY; St. Louis and Kansas City, MO; Miami, FL and Chicago. 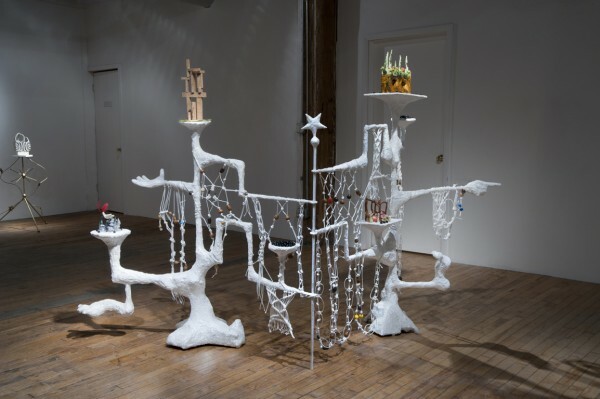 Her work has been written about in artnet Magazine, Beautiful Decay (online), Time Out Chicago, The Chicago Tribune, Newcity, ArtForum, Frieze Magazine, Art in America and Whitewalls.Â Schwartz earned her MFA at the University of Illinois, Chicago. I caught up with her after the close of her most recent show of work at Threewalls. The following is our conversation. "Credenza". Image courtesy of the artist. DG: How do you think about your materials? 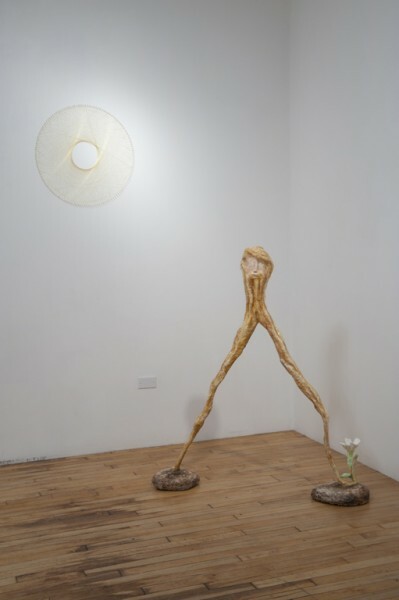 MRS: The materials and processes I use have to make sense in relation to the meaning of the piece.Â So, for example, in this body of work, one of my reference points are remembered objects from the house I grew up in.Â So my use of ceramics, macramÃ©, white stones, and gold chain are materials I came in contact with in my past and have resurfaced to add to a palette of materials for sculpture.Â I am also interested in processes and skills that I learned while growing up, before I made it to art school.Â Why do I know how to make every type of lanyard key chain, or a macramÃ© belt, or to crochet a yarmulke, or to paper mache? They are a window into specific class, cultural and gender specific moments that shaped my experience. DG: What else makes up those â€œreference pointsâ€? MRS:Â As I was developing my proposal for Threewalls, I wanted to transform the gallery space into an idealized and symbolic domestic space. There is a smaller room as you enter, a large grand space in the center and a smaller more intimate space at the end.Â As you walk through, I thought of the first room as the foyer, the next as a living room and the last, a sunroom. In a home these are the spaces that you pass through, or only use on occasion or special occasion, not the every day living spaces. The sculptures in each of the spaces are an amalgamation of the furniture, objects and people that would reside there. They reflect the kind of pictorial or fictive aspect that each of those rooms implies.Â Â Some of the sculptures in the living room space are: Chandelier, Credenza, and Vanity. I mean the credenza, what is it for? Who has room for the credenza? Itâ€™s a piece of furniture thatâ€™s purpose is to hold and display decorative objects and fancy dishes. The Chandelier too has a type of aspiration to it, a light that is dressed up in its finest jewels. These objects and what they represent become starting points to imagine their transformation into something else. DG: Then what about the sunroom? MRS: I was trying to create a space that was sort of mournful and had a kind of longing to it, but peaceful too. The sunroom has a sun in it, of course.Â It is created through a technique called, string art, which was a craft process I learned in fifth grade.Â It was supposed to teach that straight lines create a curve. The piece is called The Tender Light of Hope. In the living room space, it has its counter part in a piece called, The Depths of Bleak Despair.Â These two pieces provide a kind of emotional bracketing for the show. Two other pieces in the space are called Friends, and A Peaceful Man.Â Â Friends are two, coil pot, heads sitting on the remnants of my grandmotherâ€™s mink coat. The coat was handed down through the family, repurposed, refashioned and redistributed as: a sporty jacket, a hat and some earmuffs. A Peaceful Man is also just a head, but his beard and mustache swoops down to form his legs and sprout a flower. I thought of it as my â€œGiacometti momentâ€. DG: You mentioned collectibles, how do they factor in? What kind of symbolism lies within them? Figurines and decorative objects have a strange life span to them, right? They sit in the home in one spot for a whole lifetime. Then they get handed down, auctioned off or go to a thrift store and go to another house to sit in one spot for another lifetime. The collectible object is really a way many people experience sculpture in their everyday lives.Â It is like the three dimensional version of a Picasso poster or, depending on your taste, a Margaret Keen poster.Â That is how I experienced it mostly, more often through home decorating than a trip to the art museum or a stroll through a sculpture park. So there are these mass-produced objects that one way or another make it into your life and stay. Over time it will look very different and mean something very different to whoever has it. In fact two identical objects become fundamentally very different things. Iâ€™m trying to show how my history with specific objects morphs their form and how I perceive them with the their stories still attached. Of the definite genres of collectible figurines some interest me more then others. I particularly admire ones that address the landscape or nature.Â I made my versions of this type forÂ Credenza.Â There are also characters that reoccur across many different brands of collectible objects; the CLASSIC mainstays of every family of Precious Moments, Lladro, or Royal Dalton are the harlequin, mime and ballerina.Â I made a series of those characters for the â€œVanityâ€ piece. Aside from the emulated realism of collectible objects, I love the sincerity of those that adopt a modernist â€œlookâ€ as their most prominent style.Â Â There is nothing like the grace or elegance of an abstract dancerâ€™s elongated neck or the motion of flowing dance attire captured in porcelain or electroplated aluminum. Detail of "Credenza". Image courtesy of the artist. DG: So you see the forms of dÃ©cor as the remnants of Modernism? Well, I guess this comes back to how and when I experienced Modernism as aÂ trickle down influence in popular culture during the seventies.Â I saw a lot of Hollywood musicals growing up.Â Most of these movies started out on Broadway and one of the byproducts of their translation into cinema, seemed to be these inexplicable dance sequence that would interrupt the regular narrative of the story to express some kind of emotional drama or conflict in the story. The Dream Sequence Ballet in Oklahoma and the Rumble scene in West Side Story are real stand- outs.Â The main characters come onto these angular abstract sets and work it all out through Modern dance.Â The piece Dream Sequence Ballerina has a little stage set and dancerâ€™s graceful head as a fantasy interlude atop a modernist piece of ceramics. DG: As you think about the decorative object, is there also a kind of spiritualism, mysticism or â€œpop-religionâ€ that is also reflected in it? 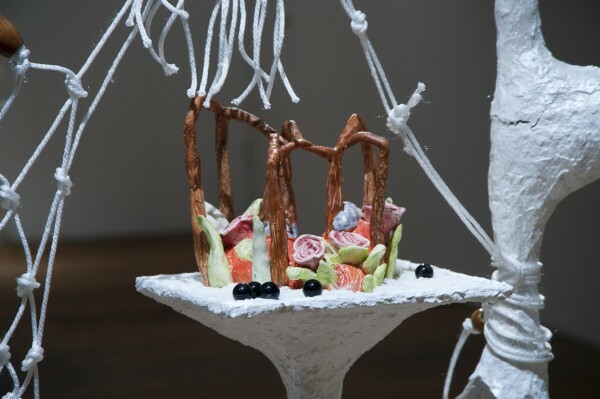 MRS:Â Objects are very powerful, especially in how they can absorb meaning or deflect it, depending on the context.Â There are a couple pieces in the show that allude to religious Jewish objects. For instance The Hands of God in the foyer,Â references a religious object call the â€œyadâ€.Â â€œYad literally means â€˜handâ€™ in Hebrew.Â It is an object that is used to read from the Torah because you are not allowed to touch the scroll.Â It is an ornate stick about seven inches long with a very realistic hand on the end of it. They really are amazing looking objects. I made two yads. These long skinny arms with big hands swoop down from the ceiling. They are the hands of God giving birth and from their palms emerge people. The figures are these half formed little homunculus men. "The Hands of God". Image courtesy of the artist. Other figurative references are more specific to cultural or historical milieu. Iâ€™m thinking of the Credenza, actually, itâ€™s feet are the â€œkeep on truckingâ€ foot andÂ itâ€™s pointing hand is from the â€œIâ€™m with Stupidâ€ Tee Shirt. DG: Ha! So how does humor function in your work, is it important? MRS: I try to combine several different emotions in one object like: Sad and pretty, or funny and strange, so there is more than one way to read the work at the same time.Â Humor is definitely in the mix.Â I think through humor and often, unlikely connections result in something amusing. Another aspect to humor in my work is through bad taste.Â Humor itself often has a double edge to it.Â It can be really nice and really mean at the same time. DG: Can you discuss your relationship to process and craftsmanship? MRS: The finished object shows the history of how itâ€™s made. There is a particular look to materials when you first learn a skill that I happen to really like.Â There is a type of enthusiasm and inventiveness that translates to the work as you try and form it into something. This has a unique type of meaning that is very different then something that has no loose ends.Â The final look of the work has to support the meaning of it. DG: How do you know when youâ€™ve gone too far, or havenâ€™t gone far enough with your sculptures? MRS: If it doesnâ€™t have a kind of balance between emotional responses itâ€™s not finished. For example I made a piece for the show where I wanted to reference something whimsical but to actually express a totally different feeling. The piece t ended up just being whimsical. There was no tension in it.Â Iâ€™ll still work on it, but it definitely didnâ€™t make the cut. There is a fine line between trying to make work about something and just making the thing in and of itself. Dan Gunn is an artist, writer and educator living in Chicago.